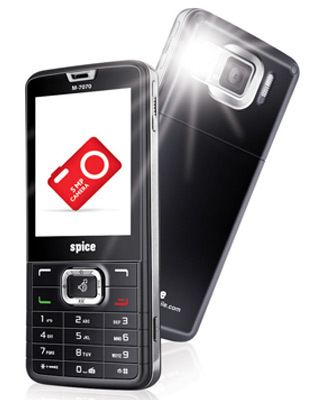 Spice mobile has launched its new mobile with its amazing features Spice M-7070, mobile has not only dual feature but it has 5 MP camera, with high resolution, which gives perfect image. This is the first camera in the duel mobile phones which has so many attractive facilities. Feature of Spice M-7070 * 5 MP Camera * Display resolution- 2.4 Inches * Dual SIM (GSM+GSM) * Anti Shake and Auto focus * 30 fbs Vedio Recording * FM recording Spice M-7070 is available all over the country with the worth of Rs. 7999 (INR), and it is coming in single Black colour.